A sunlight readable display, also referred to as a high brightness display, allows for images to be easily seen even in environments with significant ambient light like outdoor digital signage or kiosks. Traditional display screens struggle to deliver a clear picture in direct sunlight because they're either not bright enough or can't overcome the glare of the sun. Sunlight readable displays feature a higher brightness output and/or special screen coatings to combat screen glare. How Bright is a Sunlight Readable Display? The brightness of a display, also sometimes referred to as its luminance, is scientifically represented in Candelas (literally the brightness of a candle) per meter squared (Cd/m2), but the more commonly used modern specification for brightness assigns a Nit value. Simply put, the higher the nits the brighter the display. The brightness of LCD displays varies greatly, but most standard industrial panel PCs and monitors are rated between 300 and 400 nits. If installed indoors, or even properly shaded outdoors, these displays are usually of sufficient brightness to be easily read. But for use in direct sunlight, or in areas of high ambient light like photo studios or quality control inspection facilities, a high brightness or sunlight readable display featuring a rating of over 1000 nits may be needed. 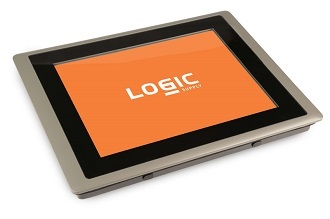 Does Logic Supply Offer Sunlight Readable Displays? Our line of Cincoze Crystal Panel PCs and Displays are available with high brightness LCD screens. Featuring brightness ratings up to 1600 nits, the Crystal Series is ideal for installation in areas requiring an ultra bright screen. Contact our Solutions Specialists for more information about sunlight readable display options.